It’s as easy as 1-2-3 to turn your car, motorcycle, boat or recreational vehicle into a donation for the animals! Have a vehicle you no longer need? Your four wheels could provide one of our four-legged friends with a second chance at life. When you donate your vehicle, proceeds from the sale of that vehicle go directly towards food, shelter, and medical attention for the animals in our care until they find a loving home. Fill out the vehicle donation form and a CARS representative will be in touch. Why not donate a used car or other vehicle you own? Boats, trailers, used farm equipment, RV’s and other vehicles can be donated too! Vehicle donations are tax-deductible at fair market value and can be picked up right from your driveway! Please call toll-free 800-240-0160 for more information or visit online at Insurance Auto Auctions, Inc. – our vehicle donation partner. 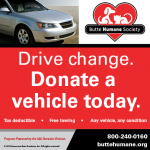 Be sure to designate the Butte Humane Society as your charity of choice!